In our house, it’s pretty rare for there to be any crackling left over from a roast pork – or, come to think of it, much pork. But when that does happen, I like making this version of bubble and squeak for brunch the next day. This deserves to be a dish in its own right, so it is even worth making it from scratch. Mix together all the ingredients in a bowl and season well. Heat a frying pan and add the oil and butter until hot. Throw in the cabbage and potatoes, cook well, adding the red and spring onion at the last minute. 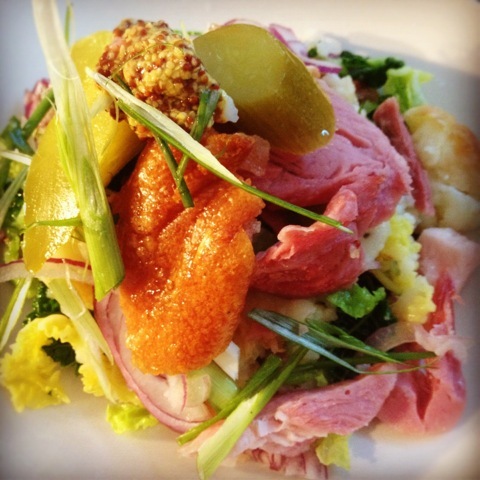 Serve on warm plates with shredded cooked ham, crackling and sliced pickles, with a touch of wholegrain mustard. With this one, the cabbage forms a great base to structure the flakes of meat, potatoes and onions on. Try to give it form and height. Laying shards of crackling and slivers of spring onion on top helps give it elegance and leads your eye across the whole dish, bringing everything together. A spoon of mustard and some sliced pickles finish it off, keeping it elegant while still remaining rustic. It is, after all, a dish of leftovers.